Rochester junior Scott Barenfeld '12 (B.S. 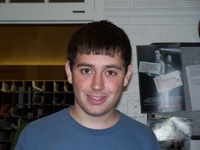 Physics & Astronomy and minor in Mathematics) has been selected as a 2011-12 Barry M. Goldwater Scholar. He is one of 275 Scholars chosen from an applicant pool of nearly 1100 undergraduate math, science, and engineering majors nominated by colleges and universities nationwide. The Goldwater scholarship provides a maximum of $7,500 for educational expenses. Selection factors include a stellar academic record, demonstrated passion and talent for scientific research, and commitment to pursuing an advanced degree in math, science, or engineering and engaging in a research-oriented career. The application requires candidates to write a two-page essay on a scientific problem on which they have done significant independent research or on a research problem of particular interest to them. Barenfeld's interests in astrophysics have led him to Professor Eric Mamajek's lab, where he has worked during the academic year since fall 2009. He spent summer 2010 conducting research at the Arecibo Observatory in Puerto Rico through the NSF-funded REU program; his work included writing computer code to help analyze data from the GALFACTS sky survey. He has been a teaching intern for courses in astronomy and mechanics, is a member of both the Society of Physics Students as well as the Society of Undergraduate Math Students, and plays trombone in the Pep Band. Barenfeld aspires to a Ph.D. in Astrophysics and a career of teaching and research in a university setting. For further details see: Announcement of the 2011 Goldwater Scholarship awards.